On Friday, October 20, alumni returned home to LJCDS in celebration of both the Athletic Hall of Fame induction events and Homecoming. This year’s Athletic Hall of Fame inductees included Thomas Wright ’95 and Dempsey Holder ’95 as athletes, and the Ings family (Jeanne, Don, Scott ’06, and Kevin ’07) as Friends of Sport. After the inductee presentation at the Middle and Upper School Homecoming pep assembly, the inductees, their families and guests enjoyed a celebration luncheon and were honored that evening at halftime of the varsity football game. Thomas Wright ’95 was an LJCDS lifer, outstanding athlete, and beloved individual who passed away last year after a courageous battle with cancer. His multitude of athletic accomplishments included being voted Male Athlete of the Year in 1993 and 1994, receiving a varsity letter in football (three years), baseball (three years) and basketball (two years), and serving as a team captain in football and baseball during his junior and senior years. His parents, Gary and Lise Wright, and brother Tony accepted the award on his behalf. 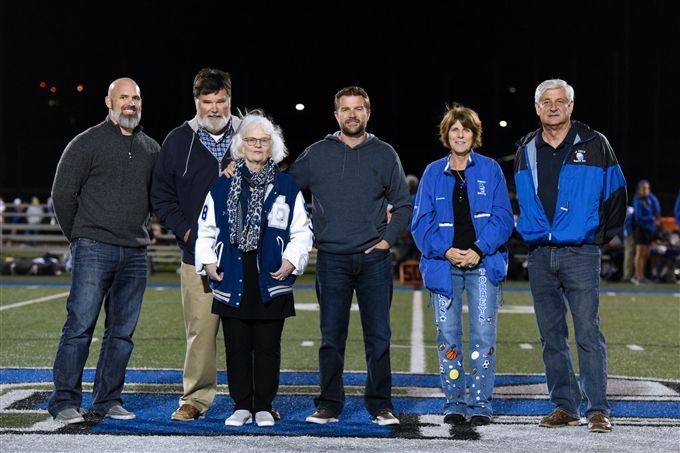 Concurrently, Thomas’s classmates from the class of 1995, along with family and friends, banded together to raise funds to renovate the press box in his honor. The Thomas Wright Memorial Press Box is a testament to the spirit Thomas left behind, not only as a gifted athlete but as a beloved friend, student and member of our community. Our sincerest gratitude goes out to the “Pride of ’95” for their invaluable initiative and generosity. Dempsey Holder ’95, a good friend of Thomas’s, joined him in the Hall of Fame. Dempsey was a standout in football and track, lettering in both for three years and still holds the LJCDS shot put record. Among his many athletic achievements, Dempsey served as a team captain of the football team his junior and senior years, and was a state qualifier in shot put. He went on to play football at the University of Redlands. The Ings family was inducted into the Hall of Fame as Friends of Sport. Don and Jeanne, parents of Scott ’06 and Kevin ’07, were generous supporters of LJCDS athletics. Don served as president of the LJCDS Board of Trustees for two terms, while Jeanne acted as president of the Booster Club for three years. The inception of the Torrey Athletic Hall of Fame occurred under her leadership. In addition, they were significant contributors to the synthetic turf field and lights, now known as Ings Family Field. During the luncheon celebration, inductees shared emotional, heartfelt speeches about what LJCDS has meant to them and how honored they were to be inducted. Former football coach Rick Woods spoke on Thomas’s behalf, sharing memories of his days coaching both Dempsey and Thomas, and how they were so close that they were almost one name, not “Dempsey” or “Thomas”, but “Dempsey and Thomas.” Rick recounted amusing stories about Thomas and the particular play he really liked on the field and also about how much he misses Thomas. Later that evening saw more alumni return to campus, as they were treated to a tailgate preceding the Homecoming varsity football game where your Torreys defeated the Orange Glen Patriots 42-12. Sophomore QB EJ Kreutzman returned to action by rushing for two touchdowns and throwing three, all to senior Alex Cho who finished with six catches for 138 yards. The senior trio of Spencer Alligood, Chase Mangini and Carson Greene led the way for the defense with 10 tackles each. In addition to a great win, Tiny Torrey flag football players, Varsity and Little Torreys cheerleaders, Madrigals and the marching band all contributed to Homecoming festivities. Click here for photos of the Pep Rally & Hall of Fame Event. Click here for photos of the Football Game.